I know Gadwall's Grill is a classic. I have memories, ever so long ago, of being a teenage bridesmaid in a particular October wedding where the reception was held in the back room of the then-somewhat young new restaurant in North Little Rock's North Hills restaurant. My teenage years -- and that black bridesmaid dress -- are nothing but memories today, but Gadwall's Grill saunters on. 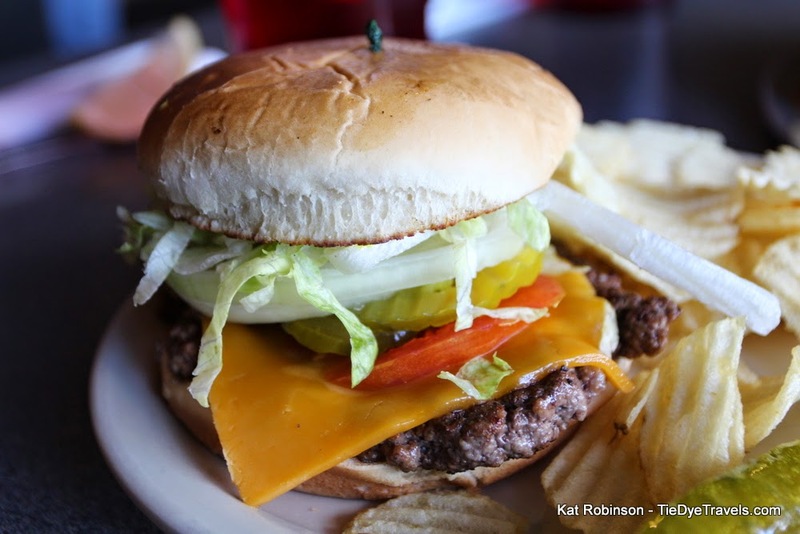 Karen Bryant and Jane Schubert, a couple of sisters, sold their Wal-Mart stock in the late 80s and bought the former Rob's Place restaurant building on the dividing line between North Little Rock and Sherwood. 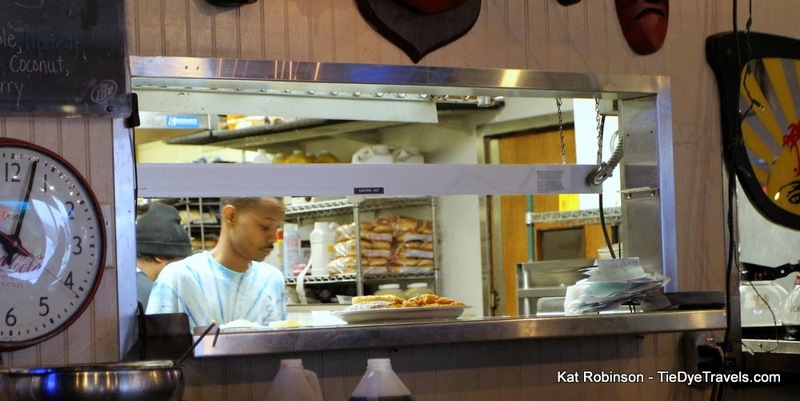 Named for a particular breed of duck, this neighborhood bar and grill manages to keep people coming in, year after year. That's probably why on my latest visit there wasn't a table to be found... a late Saturday morning breakfast foray into the eatery atop a hilltop found few places to park, every table in the place taken and a few folks even waiting by the door. 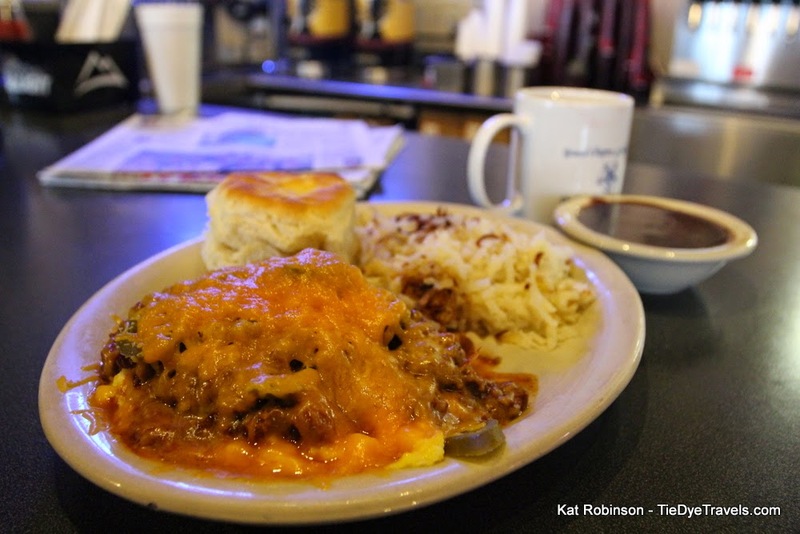 Being on my own, I managed to grab a seat at the bar, where a copy of the statewide paper was sitting out and where a young man had a full mug of coffee in front of me before I'd even located a breakfast menu. Not that I was going to need it. I'd come with a particular dish in mind. This happens to be it. 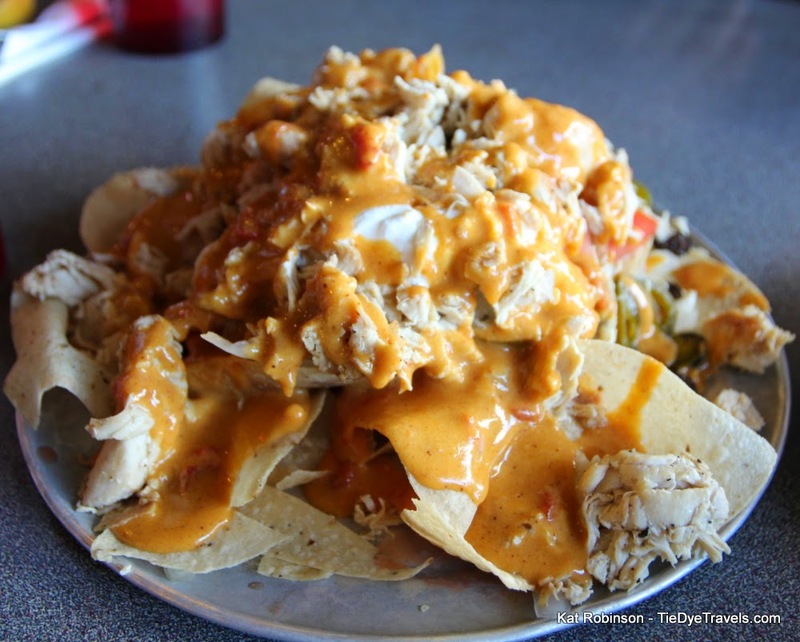 This is the Gut Bomb, scrambled eggs piled high with chili, jalapeno peppers and cheddar cheese. You can have hash browns or breakfast potatoes with it, a biscuit or English muffin or toast as well. this concoction? Masochism, I suppose, The sheer number of jalapenos tightly placed in a thick layer between cheese and chili would flatten even the most earnest diner. Most of these ended up on the side of my plate... and my waitress asked if I wanted to save them for dessert. But that chili... oh, man, that chili. 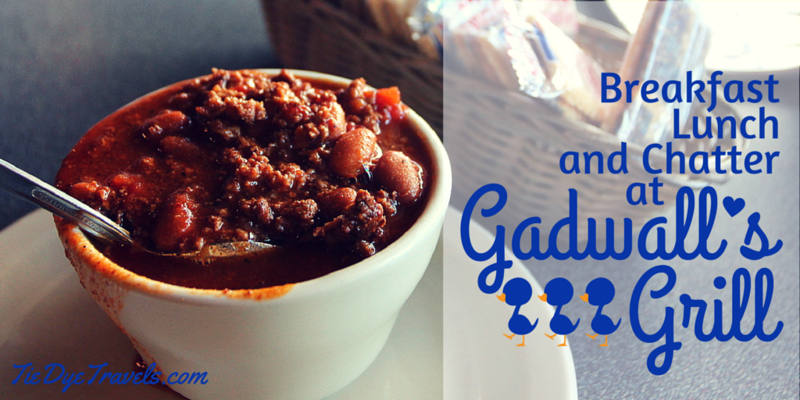 Gadwall's Grill actually offers two types, a white chili and one that's called Woman Made Chili, which is a beany, beefy cumin-laden concoction worthy of lone enjoyment. I won't turn down beans for breakfast, and this ample serving that about obliterated the obligatory eggs beneath was substantial. I skipped lunch after this grand repast. Of course, I have to mention something else. This breakfast came with dessert -- I ordered my plate with the biscuit option and a side of chocolate gravy. Now, I can take or leave chocolate gravy. 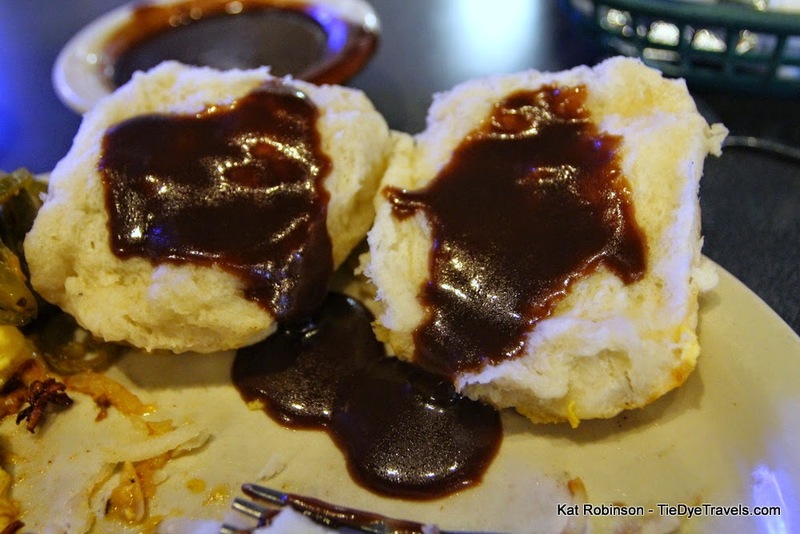 The Arkansas-based condiment is often abused and even outright replaced with soupy chocolate pudding some places. It's often too salty or too sweet and sometimes outright unwelcome. But that's not the case at Gadwall's, where the syrup-thick roux is buttery with the perfect sweet to salt balance. It's the best chocolate gravy I've had in any restaurant, and 'twere not for the audience you get of cooks and wait staff when you sit at a restaurant's bar, I might have been better tempted to drink it straight from the bowl. Doused as it were on pliant, thick biscuit halves, it was a marvelous end to a meal and a perfect coffee accompaniment. with a next-door eponymous pizzeria. I know there are individuals who would rather swear on the Great Northern bean and chicken breast white chili, and it's more than adequate. 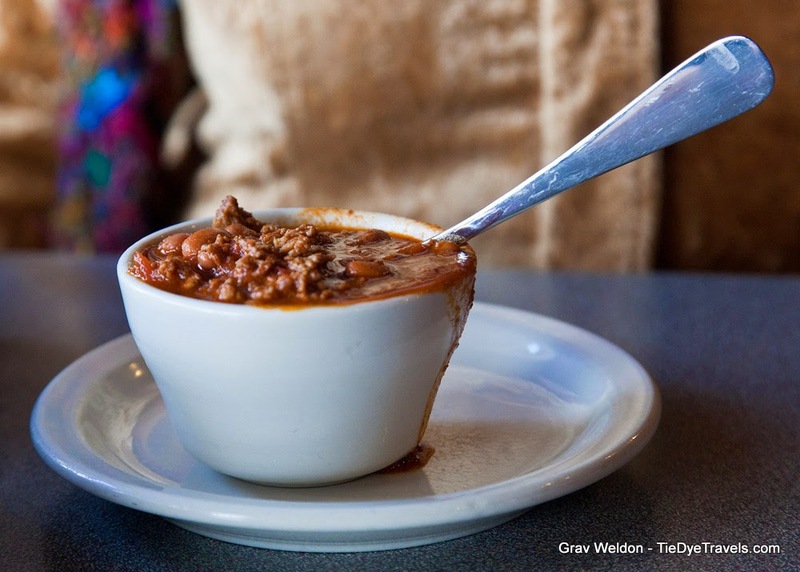 But Woman Made Chili is Gadwall's raison d'être, a substance that permeates the menu on Bonsai Nachos and short chili dogs. 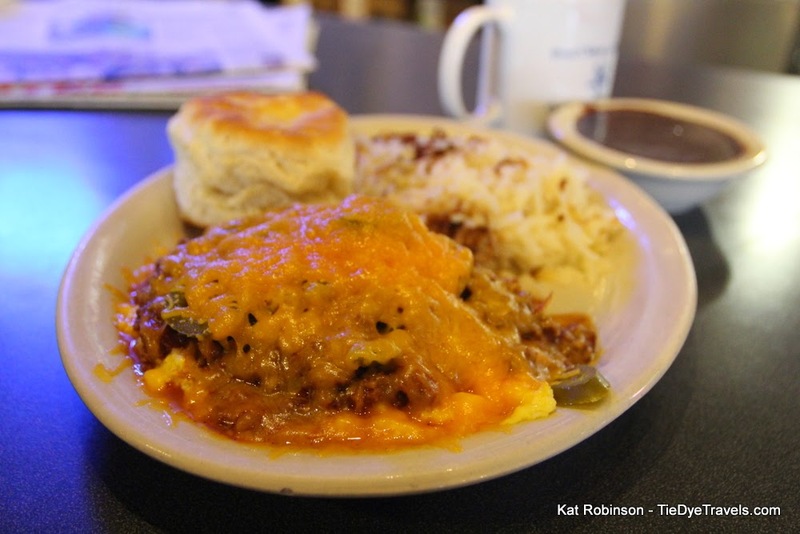 It is simply hearty, delicious eats. 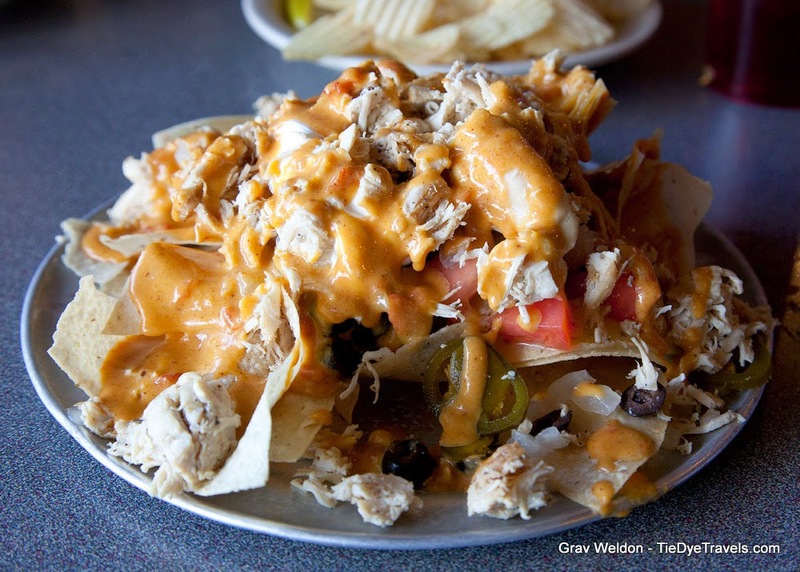 Grav and I recently stopped in for a bite, where he tried the Chicken Nachos, a platter-sized mound of tortilla chips slathered in cheese dip (of the yellow, spice-packed variety), gobs of shredded chicken, black olives, jalapenos and tomato chunks. An impressive site to behold, and far more than one individual should undertake in a sitting. 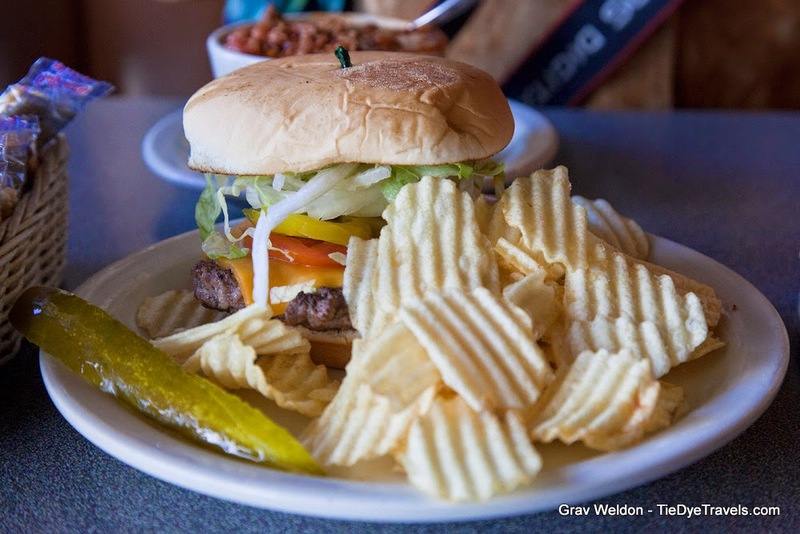 I did rather enjoy the Old Fashioned Cheeseburger, a mustard-accented griddle smashed burger on a toasted seedless bun with a hunk of white onion amidst the customary lettuce, tomato and pickle. 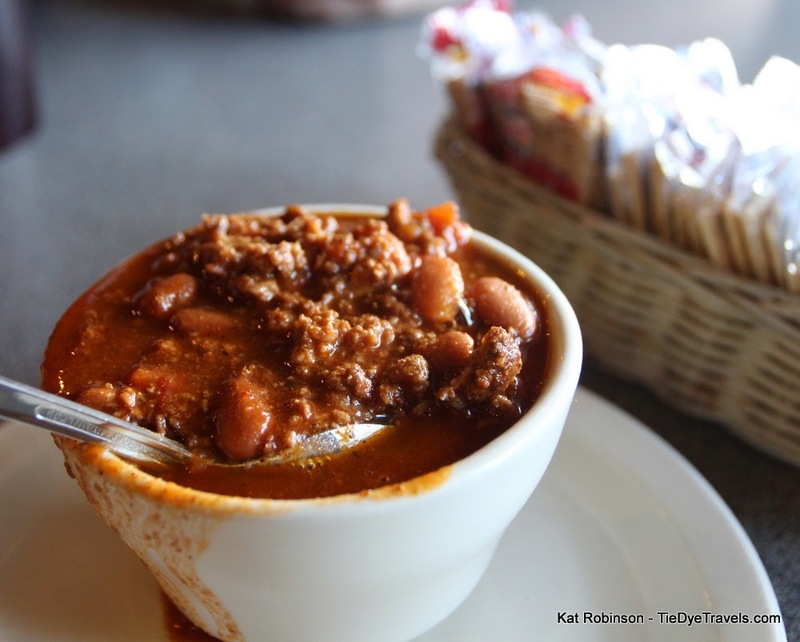 But my best enjoyment came from dipping it in my bowl of accompanying Woman Made Chili. 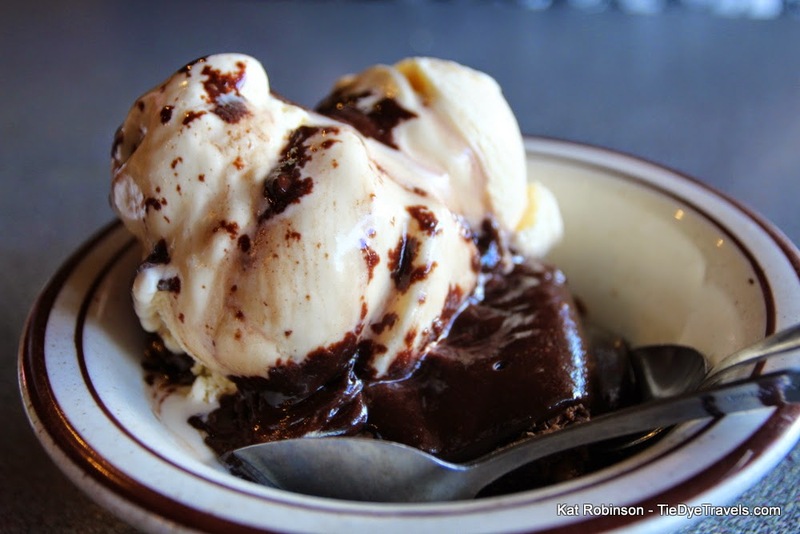 brownie crowned with vanilla ice cream, sweet and very thick and gooey and more than you expect. 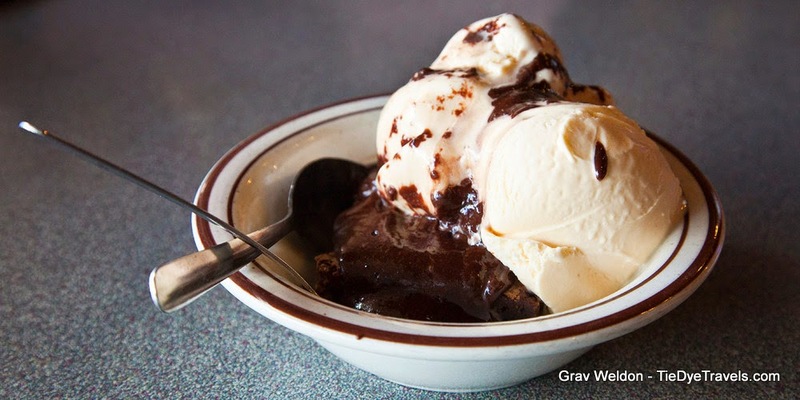 Brownie Under is the proverbial "waffer thin mint" for diners -- I suggest sharing as your only recourse to painful overfilling. 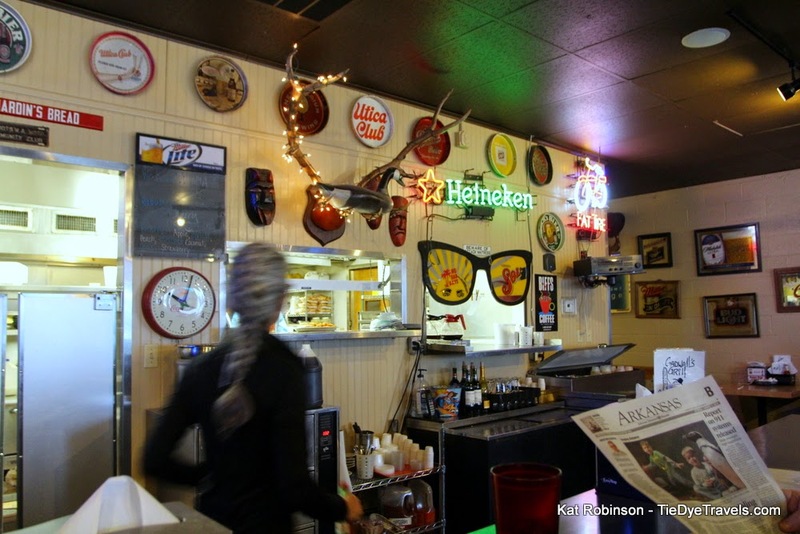 Gadwall's Grill is not a trendy place. It is stuffed with memorabilia of a quarter century or better of north-of-the-river life. The wait staff is friendly and the regulars are thick. You'll find a good comforting meal within. I LOVE Gadwall's Grill. I love their burgers -- so delicious. 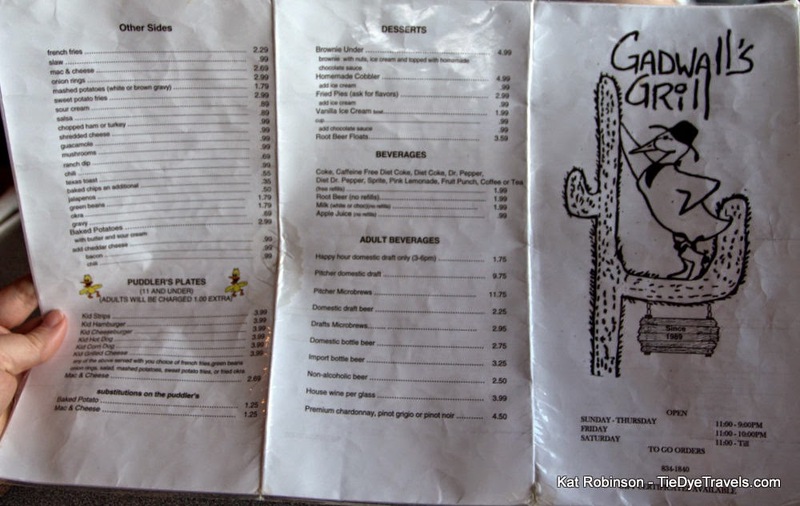 But I think my favorite items on the menu are their cheese dip and their fried pickles. Yum, just yum. Oh my goodness you are exceptional. I am on my 3rd blog and have so much to learn. I googled about my chocolate gravy tonight then found this, oh I have so much to learn.